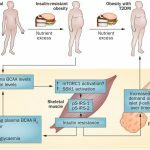 Oxidative stress in living cells is defined as the imbalance between the oxidants generated by cellular respiration and metabolism, and the cell’s antioxidant defense system in favor of the oxidants. Reactive oxygen species (ROS) are continuously generated by the mitochondrial electron-transport chain. In healthy cells, ROS levels are under homeostatic control by the endogenous antioxidant defense system that includes biological antioxidants such as glutathione (GSH), vitamin E, and vitamin C and antioxidant enzymes including catalase, superoxide dismutase (SOD), glutathione peroxidase (GPx), and heme-oxygenase I (HO-1). Thus, oxidative stress occurs when levels of ROS generated exceed the cellular antioxidant capacity (Finkel and Holbrook, 2000; Klein and Ackerman, 2003; Cheli and Baldi, 2011). 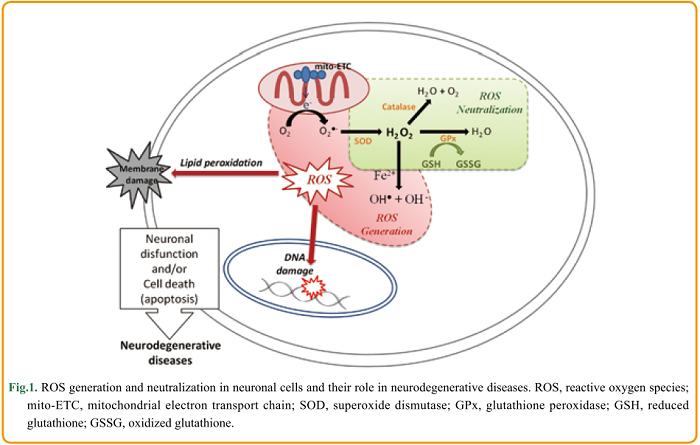 Neuronal cells are more sensitive to oxidative stress than other cells for a number of reasons, including their high rate of oxygen consumption, which generates a significant amount of ROS, and a modest antioxidant defense. Neuronal cell membranes are also rich in polyunsaturated fatty acids (PUFAs), which makes them highly sensitive to oxidation by extracellular ROS (Friedman, 2011b). In eukaryotic organisms, ROS are continuously produced by the mitochondrial electron transport chain where molecular oxygen is reduced to O2●- due to the escape of an active electron. As illustrated in Figure 1, the generated O2●- is spontaneously or enzymatically converted to H2O2 . Thereafter, H2O2 can be converted to OH● and OH– by accepting an electron in a reaction catalyzed by transition metal ions (Fe2+ or Cu+). The generated hydroxyl radicals are highly reactive and are believed to cause significant oxidative damage. In order to prevent the formation of these harmful hydroxyl radicals, H2O2 is converted to water via reactions catalyzed by enzymes such as catalase and GPx (Lushchak, 2014). The intracellular concentration of H2O2 is therefore tightly controlled by the cellular antioxidant defense system. The homeostatic concentration of H2O2 ranges between 1 and 700 nM, and an intracellular concentration above 1 μM is considered to induce oxidative stress (Gülden et al., 2010) . H2O2 is therefore used as a model to investigate the oxidative stress mechanisms within neuronal cells. Whittemore et al. (1995) showed that exposure to low concentrations of H2O2 (10-100 μM) induced apoptosis of neuronal cells. Specifically, they reported that exposure to 30 μM H2O2 for only 3 h induced nuclear changes characteristic of apoptosis, including chromatin condensation, nuclear pyknosis, and fragmentation. There is wide variation in the H2O2 concentration thought to be cytotoxic, with estimates ranging from 10 to 1000 μM. It is important to consider the role of metabolic H2O2 in redox signaling. H2O2 is being increasingly recognized as a messenger molecule. It is involved in signaling pathways involved in changes to cell shape, the formation of actomyosin, and the recruitment of immune cells (Sies, 2014). Oxidative stress induced by H2O2 was first thought to cause only lipid peroxidation, DNA and protein damage, but it is now known that H2O2 activates various intracellular signaling pathways closely associated with neuronal cell death and survival (Ruffels et al., 2004). The cellular response to H2O2 depends on its intracellular concentration: low levels (3-15 μM) stimulate growth, whereas increasing concentrations induce cell growth arrest, apoptosis, and finally necrosis (at levels above 1 mM) (Gülden et al., 2010). The turning point between signaling and toxicity is still to be determined and may vary depending on the cell type and metabolic conditions (Saito et al., 2006; Sies, 2014). Therefore, choosing the appropriate experimental conditions when using H2O2 to study oxidative damage (and potential protective treatments) is paramount. Friedman J (2011b) Why is the nervous system vulnerable to oxidative stress?. 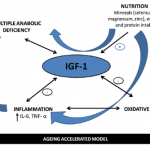 In: Oxidative Stress and Free Radical Damage in Neurology (Gadoth N and Göbel HH, ed.). pp. 19-26. Humana Press. Lushchak VI (2014) Classification of oxidative stress based on its intensity. EXCLI J., 11: 922-937. Saito Y, Nishio K, Ogawa Y, Kimata J, Kinumi T, Yoshida Y, Noguchi N and Niki E (2006) Turning point in apoptosis/necrosis induced by hydrogen peroxide. Free Rad. Res., 40: 619-630.